What’s the difference between preventative, cosmetic and restorative dentistry in Shoreline? And why do you have to pay separately for each? Wouldn’t it be better to have an all-in-one comprehensive (holistic) solution to your dental problems? , one that prevents dental problems in the first place? Learn how Dr. Co’s comprehensive dentistry in Shoreline ensures gorgeous, healthy, and functional smiles for decades. Comprehensive or holistic dentistry focuses on preventing dental problems from developing in the first place. And when repairs are needed for whatever reason, the comprehensive dentist’s aim is to create a restoration that is minimally invasive, one that enhances your overall appearance, and that will last for decades without causing problems. With traditional methods, you would have to address each of these concerns with multiple dentists or multiple appointments — resulting in more time and money spent on dental treatment. Not to mention the many tiny restorations that weaken the structures of your smile. Wouldn’t it be easier to have one dentist perform all 3 main aspects of dentistry in one appointment? Your comprehensive dentist, Dr. Co at Shoreline Dental in Washington is qualified and trained to use gentle techniques and digital-age technology to ensure every part of your smile looks gorgeous, functions perfectly, and lasts longer than you can remember when was the last time you had dental work done. Biology: how a serious medical condition or medication will affect your oral health, and vice-versa, how the condition of your smile will affect your heart, digestion, and reproductive organs. We focus on more than just repairing one tooth at a time; we focus on the whole-person to prevent your smile from needing to be fixed at all. How Does Comprehensive Dentistry Work? You need a dentist who can balance perfectly look, feel, and function for your smile to endure and thrive. We will be pleased to meet you and your family to provide comprehensive dentistry solutions in Shoreline. 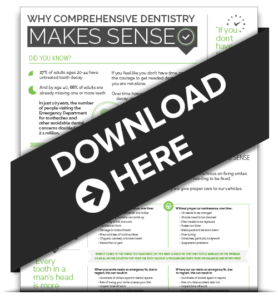 Call us (206) 440-0065 to schedule your comprehensive (holistic) smile consultation and don’t forget your free Comprehensive Dentistry Infographic.